← Do Bats Carry Diseases? Bats are fascinating mammals with incredible appetites and impressive flying skills. However admirable, bats can still be a nuisance to property owners because they can cause loads of structural damage and even pose certain health and safety hazards. You see, bats in Indiana can fit through openings as small as 3/8th an inch! This means they can quickly find access points that allow them entry into residential and commercial buildings. Once inside, they find the darkest, coziest, and most secluded area to roost. When this situation comes to attention, the only solution is licensed bat removal and bat control. 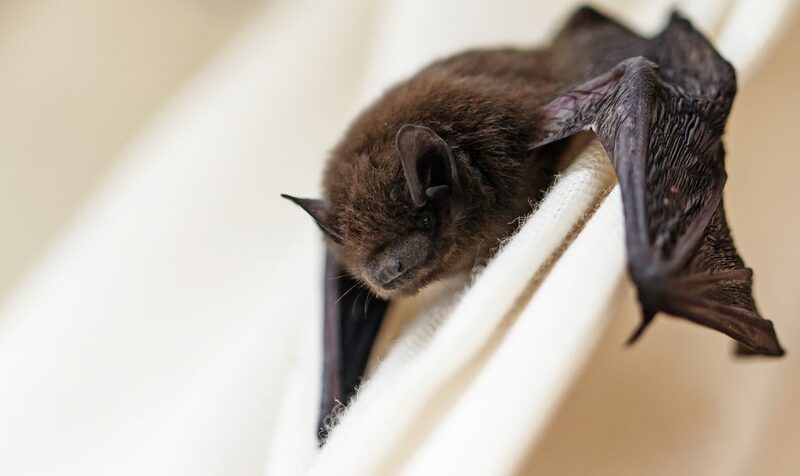 If you suspect that bats are a potential nuisance around your property, you may find these frequently asked questions about bat removal quite helpful. What are the Signs of Bats in the House? The most common signs that bats are living in your attic or some other interior area of your home are sounds. Hearing strange chattering, fluttering, chirping, or shuffling noises in the walls or ceiling is a standard indication of bats in the house. Also, finding bat dropping (guano) on your property is a blatant give-away. You can also look for oily or grease-like stains on walls, windows, door frames, siding, and other possible entry points for bats. These are all common signs of bat activity. Another tell-tale sign of a bat infestation are stains on walls and ceilings, or foul odors that seem to come from them. Can I Remove Bats Myself? Bats can be dangerous, and even protected under law, so never attempt to touch, trap, move, harm, or kill a bat in or around your home. Having the proper equipment and experience is crucial to successfully getting rid of bats from your property and preventing them from re-entering again. Bat abatement involves a lot more than just extraction, and in most states, even requires a professional licensed. You could face potential fines and other penalties if you tamper with a protected bat species, or attempt to transport an exotic wildlife animal without the proper authority. Are Bats Dirty Like Rodents? Well, yes, because bats are wild animals. Although they known carriers of various infectious diseases that are hazardous to both people and pets. Such diseases include the Rabies virus, Histoplasmosis, Leptospirosis, and even Salmonella. All of these infections can be transferred, transmitted, and passed along to humans and pets; and they are all potentially fatal if left untreated. Bats are not naturally aggressive mammals, and they are more afraid of you than you are of them. So they are not likely to “attack” unless they are provoked in some way while trying to protect or nurse their young, or they are infected with a disease. If you find a bat on the wall or other area inside your home, immediately relocate all people and pets to a secluded room. From there, open up all of the windows and doors to the adjacent rooms, and then gently tap the surface near the bat with a broom or other long-handled device. This will encourage the bat to fly away, and hopefully, outdoors. If this does not work, contact a licensed Louisville bat removal company for emergency service. Where Can I Get Affordable Bat Removal in Louisville? 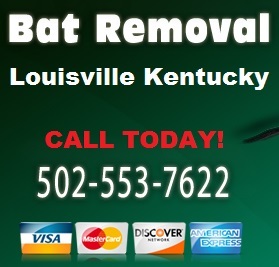 Call 502-553-7622 for prompt and professional Louisville bat removal you can trust. We are DNR licensed and insured wildlife rescue and control professionals with more than two decades of experience working with bats. We offer residential and commercial abatement services, including minor attic restorations for bat damages. Request a free estimate, today. This entry was posted in Bat Removal and tagged bat removal faqs, bats in the house louisville, frequently asked questions bat rabies, frequently asked questions bats, louisville bat removal. Bookmark the permalink.